The Condenser consists of tube bundles that are horizontally arranged into a two pass design. It is located at a level below the Low Pressure Turbine. Steam from the Low Pressure Turbine condenses on the outside of water cooled tubes and the condensed steam flows into the hotwell, which provides condensate storage for one of the two 100% Condensate Extraction Pumps. The steam space of the Condenser during normal operation is under vacuum (at 32mbar). 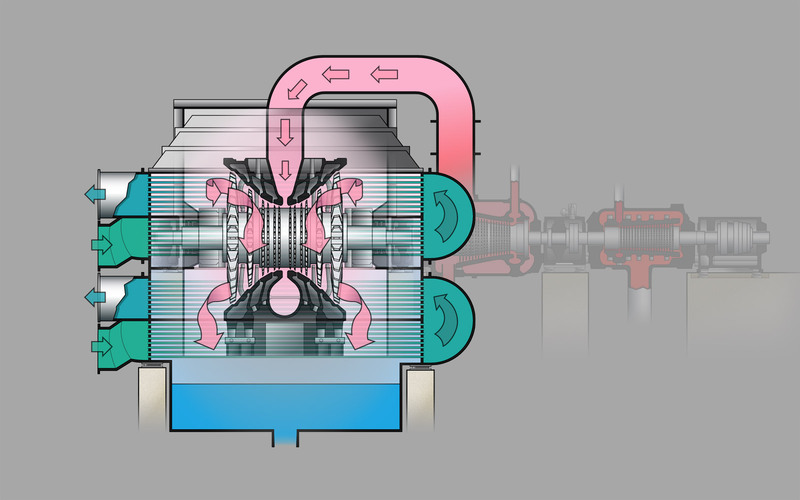 Once the steam passes through the turbine it enters the Condenser. Here the steam undergoes a change of state and is converted back into water. In Aghada, the cooling tubes are made of titanium (corrosion resistant) and mounted horizontally. Steam travels vertically under the influence of a partial vacuum over the tubes (1). Sea water is pumped through the pipes in order to cool them (2). This system is far more efficient than simply air-cooling the exit steam. The change of state from steam to water means the H2O can be efficiently pumped back up to the HRSG so the cycle continues. The latent heat, present in the Condenser, is transferred to the cooling water and rejected back to sea.